In the world of high-level ski racing, the ski servicemen get a fair amount of attention for their role in the net result on race day. Hero or goat, at least they get some notice. On the other hand, where’s the acclaim for the boot guy? Yeah, that unsung hero who addresses a ski racer’s primary point of contact with their equipment. What does he do? When does he do it? How do you pick him out of a crowd? And who even needs a boot guy in the first place? Without the boot properly sized and adjusted for a number of variables, the best ski athletes in the world would have a hard time even leaving the starting gate. Accounting for fit anomalies, adapting the flex for individual strength and power as well as technique and the discipline, and finally aligning for best performance are just a few of the bootfitting magician’s acts that go on behind the scenes. Within the ski world there are hundreds of ski shop employees who are called bootfitters. This article is not about them or even bootfitting in general. There are plenty of well known and accomplished bootfitters all over the country and world who can help a customer have a significantly better ski experience. The purpose of this article is to illuminate the few individuals we have based here in the U.S. who posses the training and proven skills for dialing in boots for the matched fit, flex, and alignment that is necessary to be a competitive ski racer. The names of these “Boot Whisperers” may come up in frequent conversation while riding on the chairlift with members of a ski team or standing in the finish area at a local race. The praises of these few are spoken in small, but important, circles. I offer this clear distinction as a way to avoid offending the many great fitters who are toiling away at ski resorts all across the U.S. and who have many other accolades to back up their work. I have broken down my recommendations into two groups of accomplished race bootfitters. The first group are “the guys” in the U.S. boot scene who aspiring U16s and FIS competitors should see. In many cases, this list is for athletes who are on the national team, part of a competitive NCAA or USCSA college program, maybe fully sponsored or partially sponsored, and brought in by their coach to begin the season in perfectly fit and balanced boots. The second group are the fitters who I recommend for all first-year U16 and younger athletes, because the second list includes the specialists based in race shops that stock a selection of junior boots in flexes 55 through 130 that are proven to work for junior racers. The race boot superstars have some interesting commonalities. They have all worked on the manufacturers’ side of the industry as World Cup boot servicemen. Each one has started, owned and operated his own business that is specifically focused on working with ski racing athletes. Most have also developed a background in ski racing or ski teaching and hold professional certifications in that realm. Folks on my list continue to do project work for some of the boot companies and current U.S. Ski Team athletes. Appointments are necessary to work with any of these individuals. Surprisingly, they also use low-tech tools that are very similar to achieve their success: Nothing fancy, they go very light on the electronic, computerized gizmo stuff. One of the differentiators for elite boot techs is that their backgrounds allow them to walk the walk and talk the talk with the highest level of coaches and athletes. The trust has been earned by this community based on tight-knit mutual respect. Lastly, they each have a client list that includes current and past World Cup athletes who have been on the podium. I am highlighting the most accomplished and well-known race boot techs, and their geographic locations are very spread out. For some athletes, it is not uncommon to make special trips that include long drives or even flights to get in to see these guys. If you can get on the schedule, the trip is worthwhile. Bob Olsen owns and operates Mt. Hood Alpine Racing Center located in Government Camp, Ore., in the summer and Parkdale, Ore., in the winter. Bob is the former World Cup boot tech for Rossignol here in the U.S. He is currently involved with the footbed company DFP, which is respected and used by a solid group of U.S. Ski Team athletes. Based on his summer location in Govy, many athletes have an opportunity to work with Olsen during offseason training camps. Matt Schiller owns and operates Park City Boot Room. Matt has worked as a World Cup boot tech for Nordica, Rossignol, and Atomic. His business is located in Park City so he is able to service many Salt Lake City junior programs, as well as the University of Utah and Westminster College. He sees many of the U.S. Ski Team athletes who train and test at the Center of Excellence. Schiller is a certified coach and ski teacher who still participates out on the hill. He has recently joined the teaching staff of Masterfit University. PJ Dewey was the World Cup boot tech for Lange during the 90s. After retirement, he opened a business in Waterbury, Vt., called Race Stock Sports. Athletes travel from all over the Northeast to get their race boots prepared by Dewey. He has been a critical player for the academies and colleges in New York., Vermont, New Hampshire, Maine, Massachusetts, and Connecticut. Brian Eggleton is based out of The Gold Peak Pro Shop that he manages for Ski & Snowboard Club Vail. His background is ski-racing based, and he has worked on the supply side in racing service for Fischer. As the entire ski racing world converges on Colorado during the fall for training, Eggleton has had the benefit of exposure to the manufacturers’ servicemen and the top World Cup athletes when they are in his backyard. His skill set parallels the other boot techs in that it is based on tried-and-true bootfitting and balancing practices. His clients are primarily athletes who are members of SSCV but he will work by appointment with any athletes. (Look for a future article on how ski academies and large clubs are addressing their program needs on this front soon). The hardest boot tech to talk about is myself, Jim Schaffner, owner and operator of Start Haus in Truckee, Calif. I cut my teeth working on boots for Salomon with U.S. Ski Team and Canadian athletes in the 80s. In the 90s, I was involved with transitioning Salomon out of rear-entry boots and into conventional overlap designs. I started my boot business, designed around providing World Cup-level service to the ski racers in and around Lake Tahoe, out of my basement in 2001. Even though my business has grown to include retail of all things ski, my role in the business remains to service the athletes and coaches who are striving to have the best fit and balanced boots with which to compete. I still work with many national team athletes like Lila Lapanja, Travis Ganong, and Bryce Bennet who all share Tahoe as their summer home. I also spent time coaching during the ski season and summer prep period, so I remain relevant to athlete needs in a constantly changing environment. I also want to give honorable mentions to two European race boot techs who are strategically located and offer very similar services as their American counterparts. Currently working for Bruendl Sports in Kaprun, Austria, is former Tecnica and Dalbello World Cup serviceman Fabi Stiepel. He first came to the U.S. to work for Stephan Kaelin in Aspen and also worked for me in Tahoe. Stiepel is very well connected to the boot suppliers in Europe, has a tremendous skill set for boot work, and he speaks German, English, and just enough Italian to be dangerous. When anywhere close to Geneva or Annecy, the name you need to know is Julian Mills. He operates the BootRoom Racing Service in Chamonix. Mills has World Cup boot experience and has worked closely with the French suppliers Salomon, Rossignol, Lange, and Sidas. He has steady hand skills, a great eye, and speaks multiple languages which help to make him an excellent communicator. Miguel Azcarate – Mud Sweat n’ Gears in Ellicottville, N.Y.
Dave Hinz – Pierce Skate & Ski in Bloomington, Minn.
Russ Shea – Surefoot in Vail, Colo.
Chuck Ginsburg – A Racer’s Edge in Breckenridge, Colo.
Bob Gleason – BootDoctors in Telluride, Colo.
Brandt Howell – Sturtevant’s in Seattle, Wash. There are plenty of other ski shops out there that service the needs of junior ski racers, and the list of those shops that have a quality staff and stock race boots would probably be around 40 establishments in the U.S. alone. Do not feel slighted if you do not see your particular bootfitter on this list, as it is a general geographic representation of where to go to see the product and get a fitting. For racers under the age of 15, now would be a great time to review my article from last year that points out what you should look for when you head to a race shop to buy your new boots. Happy hunting, and even happier fitting this fall! - Jim Schaffner started his career with Salomon North America and has built race boots for athletes of all ages and abilities since the early 80s. 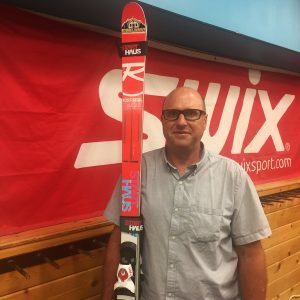 He is currently the owner/operator of the Start Haus ski shop in Truckee, Calif., where he continues to follow his passion for helping young athletes achieve their athletic goals with perfectly fit and balanced ski boots. How a Tri-Regional Camp in South America is helping groom the next generation of U.S. stars. Budget cuts in Alaska put the Seawolves’ future in question.